Based on National Visual Arts Standards for English Language Arts. Lessons encourage reading, writing, storytelling, wordplay & vocabulary learning. Each lesson is in a full four-page spread. Objectives, standards, word lists, background information, preparation, assessments, extensions, additional resources, diagrams, tips and more – everything needed to deliver lessons. Emphasizes the value of visual learning in all curricular areas, and calls attention to the creative work of children through exhibitions of student artwork. Students explore Social Studies topics in-depth as they study advanced technologies, reflect on cultural differences, compare behavioral changes and examine positive character traits. Based on National Visual Arts Standards and the National Social Studies Standards and the applicable National Health Standards. Each lesson is a full 4-page spread — it’s complete, comprehensive, organized and saves time. 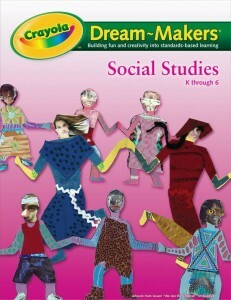 Time-saving, easy-to-use Dream-Makers educator’s guide with complete lessons and instructions for Grades K-6th. 24 lessons, 104 pages. Engaging activities and ideas enhance learning. Each lesson is in a full four-page spread so it’s complete, comprehensive and organized. Includes objectives, standards, preparation and more – everything needed to deliver lessons. as a supplement or primary curriculum. TODAY ONLY: $1.49/1 or buy a complete set for only $5.00!